Jammu, November 21: Lakhs of pilgrims on the occasion Kartik Purnima today participated in the special prayers and archana held in traditional way at Baba Jitoo’s Samadhi at Jhiri. Besides Jammu & Kashmir, the pilgrims also came from Punjab and Himachal Pradesh, Haryana, UP, Rajasthan and Mahrashtra and participated in the Jhiri Mela, which was inaugurated by Deputy Chief Minster Jammu & Kashmir on November 18 and it will culminate on November 27. The pooja was held early in the morning and later in the evening also. The devotees also took a dip in the holy water. Baba Jitoo a medieval period saint had sacrificed his life to fight injustice of the ruler and the feudal lords. The concept of land to tiller given by the Jammu & Kashmir Government after independence has its origin in the Baba Jitoo’s supreme sacrifice. 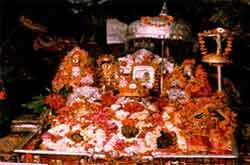 The Samadhi of Baba was set up at Jhiri over 650 years back on Kartik Purnima and since then as a tradition Mela (Festival) is held every year here in which lakhs of people drawn from different parts of the country participate. In the meanwhile Minister for Health, Horticulture and Floriculture, Jammu & Kashmir today inaugurated the departmental stalls at the weeklong Jhiri Mela at village Shama Chack near here. The Minister reviewed the arrangements made by the district administration for the smooth conduct of this famous Mela which is expected to witness huge rush of devotees from across the country. Congratulating the Management Committee of Jhiri Mela and administration for making excellent arrangements in the Mela, the Minister asked the officers to maintain close coordination between the Management Committee and different agencies associated with the Mela to ensure success of this annual event. He gave thrust for ensuring availability of un-interrupted power, water supply and adequate stock of medicines and other essentials at the Mela site. He also asked for ensuring proper sanitation in the Mela. The Minister said that Government would further upgrade the facilities for the visitors in the Mela, adding that efforts are being made to bring this revered place on the tourist map. The Government has already announced certain measures for the beautification of Jhiri and its surrounding areas to attract the tourists. The Minister announced construction of a floriculture park at the Mela site for the facilities of people. He asked the Management Committee to identify the land for the purpose so that the work could be started at the earliest, Mr. Sham maintained. The Minister also paid obeisance at the shrine and paid floral tributes to Baba Ji and Bua Kauri. The Minister also witnessed the dangal (wrestling competition) which ended into a tie. Later the Minister distributed prizes among the wrestlers. 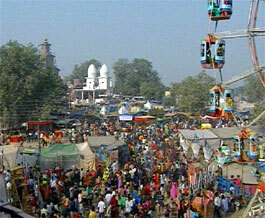 Read more information on Jhiri Mela (Festival).